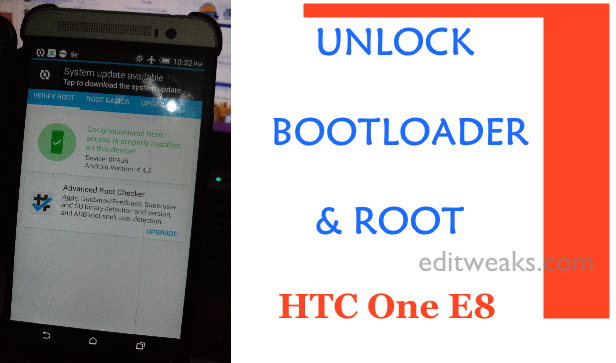 Unlocking bootloader and rooting HTC One E8 is really simple after following the steps we personally used and will show you below. Before we proceed; let's quickly introduce us to HTC One E8. HTC E8 is a plastic chassis version of the HTC One M8, we all know M8 is a popular flagship made of metal but E8's body-make is the only obvious difference, a plastic chassis, so apart from body-build, HTC One E8 and M8 sports almost the same specs hence HTC One E8 also runs Android Kitkat 4.4.2 out of the box that we'll be rooting. 4. Download SuperSU Root (UPDATE-SuperSU-v2.02.zip) for the HTC One (E8) to your computer. Connect your smartphone to your computer via USB cable. Copy and paste the UPDATE-SuperSU-v.02.zip file to your SD card, making sure the file goes to the root folder of your SD card and not to another folder. Ensure to Enable USB Debugging, To do this, go to Settings >> Developer options, scroll down till you see USB debugging. Also make sure you activate developer mode on the phone. Go to About Phone, scroll down to Build Number and tap it 7 times. 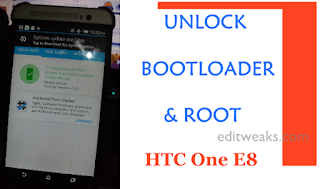 Unlocking Bootloaders on any HTC device is the first step to take before eventually rooting or installing TWRP or any recovery into it. ii. Use Adb Command prompts. To do this, Download this file. Unzip it and choose your C:\ drive when installing. 1. Now plug your HTC, it should Sync with the HTC Sync manager we downloaded Earlier. Once it says connected, minimise the software from your PC. 2. On your Windows start menu search command prompt, Or use Shortcut > Press "Windows Menu key + R." then inside it type CMD and hit enter. 3. Your device should still be connected at this point. you'll see the Bootloader mode displaying "UNLOCKED"
Use volume down button to scroll down, use Power button to choose - FASTBOOT. Your device will switch On. 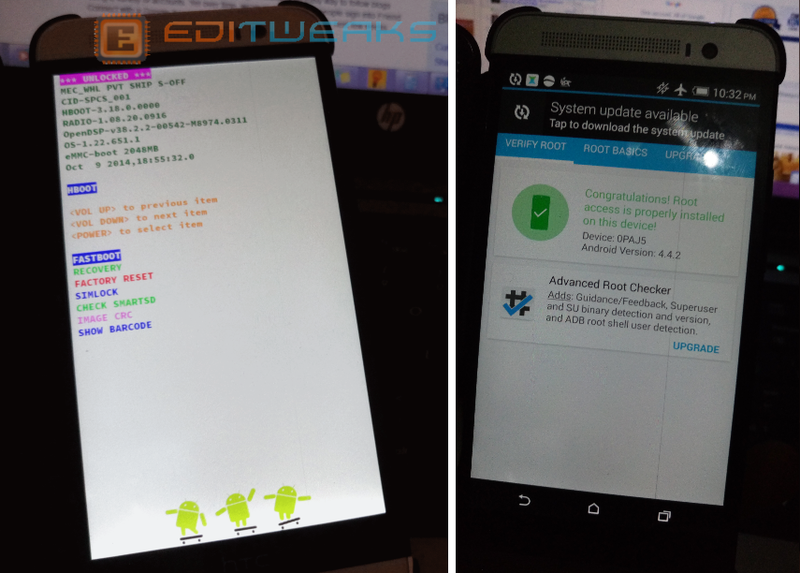 Install Root Checker and Confirm by granting Access to Super SU. 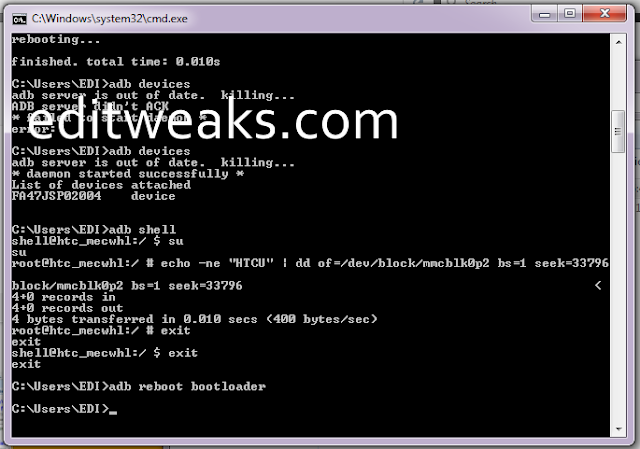 Congrats you successfully Rooted your HTC One (E8).